For silver prices, 2016 has been a good year. Silver is up about 20% so far this year. Given that strength, investors are likely wondering if they should continue to buy silver. Morning Money Resource Investing Specialist Peter Krauth says yes – silver prices in 2016 will continue to rise, even if there's volatility on the way. He believes the silver price can rise to over $22. That means investors who like to own silver can buy now, as overall prices will rise for the year. Any pullback you see in silver is a great buying opportunity. The technical picture shows a glowing outlook for silver. Why? Krauth notes that the relationship between the 50-day moving average and the 100-day moving average is often important in tracking precious metals price trends. If the 50-day moving average line crosses upward above the 200-day moving average line on a chart, it's a bullish sign. The event is called a "golden cross." The market recently saw a golden cross with the price of gold. That means the outlook is bullish. Krauth observes that the price of silver is on pace to follow both the cross movement and the bullishness in its wake. In addition to watching the cross, investors should consider the gold/silver ratio when considering buying silver. What's the gold/silver ratio? Simple. It's the gold price divided by the silver price. Krauth has tracked the ratio. Historically, it stood at an average of 55 before the financial crash. Currently, it trades at multiyear extremes. If it were to return to the historical average, it would signal a rise in silver. Given a gold price of roughly $1,230, a 55 gold/silver ratio would result in a silver price of slightly over $22 – which is Krauth's estimate of the future price. In addition, if gold rises – which Krauth also forecasts – the 55 gold/silver ratio would result in even higher prices for silver as well, which is a positive for investors who buy silver. U.S. Federal Reserve Chair Janet Yellen signaled earlier this year that, while the Fed will be tightening interest rates, they intend to tighten very gradually, in response to fears that the economy's strength is losing steam. Generally, interest rates have an inverse relationship with silver – and any kind of rising rates are not good news. In a rising rate environment, investors start looking for investments associated with income. In addition, dollar-denominated commodities – like silver – become more expensive. However, according to Krauth, investors are buying silver derivatives at the fastest pace in the last two years. What does that mean? That investors are focusing more on the safe-haven benefits of silver than on the impact any Fed move would have. Silver Coins: Silver coins can be investor-grade bullion coins to collectibles and junk coins. Usually – like with many items – you pay more for higher quality silver. Different dealers have different premiums, so shop around. One good way to hold this metal is by buying U.S. Silver Eagles. Silver Eagles come in varieties of weights and can be very affordable. They have a fineness of 0.999. It is a good idea to dollar-cost average the purchase of any precious metal, including Silver Eagles. With dollar-cost averaging, investors buy in small amounts over a period of time. That way, they are entering the market at various pricing levels. Precious metals stocks are volatile, and dollar-cost averaging will protect investors from the risk of buying at the highest prices. Silver Bars: While bars can't be used as legal tender like many coins can, they do provide good value for your investment dollar. You are paying for silver, plain and simple, and not a premium for some other intrinsic value that comes packaged with a silver coin. Also, depending on how much you wish to invest, you may be able to put all of that value into one bar, making it much easier to track, store, and exchange later on. Many investors picture silver bars as simply shiny, blank bars that you stack in a secure location as a safe-haven investment. Start looking around, however, and you'll quickly find that there are some very fancy silver bars on the market. There are two different kinds of silver bars. Bullion bars are guaranteed to be at least .995 pure silver and are either rectangular, circular, or triangular in shape. They are blank except for the stamp that signifies weight, purity, and fabricator brand. Art bars are another form of silver bar that have fancy images stamped onto them, making them appealing to collectors. As there is often a premium paid for these graphics, the value to the investor is reduced. 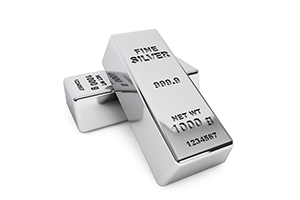 Silver bars generally come in four sizes: 1 ounce, 10 ounce, 100 ounce, and 1,000 ounce bars. Interestingly, the premium over spot price is higher for the lightest bars because their fabrication costs per ounce are greater. Therefore, it is more cost-effective to purchase the larger bars in most cases. Paper Silver: Paper silver is great for those who aren't looking for physical silver ownership. This includes stocks, ETFs, and futures contracts. Given the trends, how else can investors buy silver? Krauth recommends Sprott Physical Silver Trust ETV (NYSE Arca: PSLV). It's a nice play for investors who want to be in the shares market but for whom the physicality of silver bullion is also appealing. Although PSLV trades on the NYSE, it is backed by silver bullion in Canada, stored at a third-party location. The bullion undergoes periodic inspection and audits. If you're ready to get started buying silver, get some additional information now and download our report: The Essential Guide to Buying Gold & Silver. I was very interested in buying silver for investment purposes until a gentleman at a silver vendor informed me that, like antiques, I need to find someone who is willing to pay the asking (market) price. If it's hard to turn back into cash, what's the point (risk)??? ?